"Yeshi" is still trying to come to terms with the trauma of discovering the body of her son being carried through the streets of the Ethiopian city of Ambo. 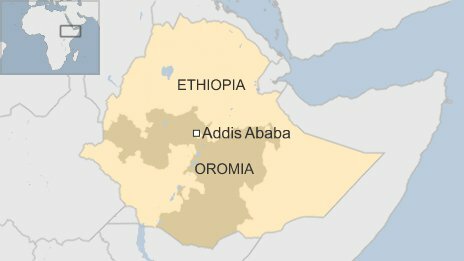 Oromia is the country's largest region and completely surrounds Addis Ababa - and some people feared they would be forced off their land and lose their regional and cultural identity if the plans went ahead. The government says the "Masterplan", as it is known, would allow them to better extend city services to rural areas. However for Yeshi - who asked for her name and those of her family to be changed - the heavy-handed response by the security forces that saw her son shot in the head is hard to fathom. Unable to recognise his features as they were too disfigured, she identified him by his "clothes and shoes". "I think they were killing people on purpose," she told the BBC, saying that Tamiru was not directly involved in any trouble that day. "His head was blackened and torn apart. The bullet had gone through his temple. You couldn't identify him by his face but I recognised his body," he said. "He was a very good boy, level-headed. He did well in his studies. Nobody has a bad word to say about him... But what good is that now?" 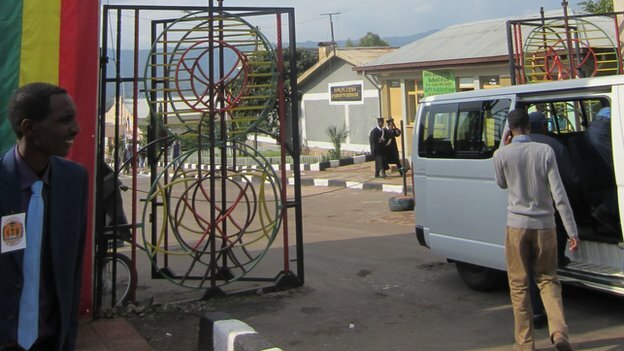 Yet this was the same place - the main entrance to Ambo University - where witnesses say the protesters and police clashed in April. Ethiopia's Information Minister Redwan Hussein old the BBC the dead included five students and 12 civilians and strongly denies that the government was responsible for any of the violence. The protest was hijacked by "rabble rousers" with a political agenda - "hell-bent on raising havoc", he said. "They were shooting, they had guns - ammunitions," Mr Redwan said. "They were attacking and fighting so it was not through the government shooting, or the police shooting that people died." "Whatever they said was not actually founded on facts." The students, the minister added, had a right to ask questions about the "Masterplan" and that the government was "ready to discuss" it with them. Mathewos Asfaw, general manager of the "Masterplan", told the BBC that the demonstrators had completely misunderstood the project and that no-one would be forced off their land. "The plan doesn't have a single concept or idea of expansion, because it's not possible to expand the city of Addis beyond the current boundary and jurisdiction." Mr Redwan says he has "no objection" to the recommendations as they are already "being implemented". "I'm very sad - until now I'm not right in the head. I'm walking around like a zombie. I'm not OK."
American Azusa Pacific University has withdrawn an honoring Ethiopian Prime Minister Hailemariam Desalegn. The Ethiopian Prime Minister faced a stinging humiliation as Azusa Pacific University (APU), whose motto is “God First”, has withdrawn an honor it had already bestowed on him. The university administration had to reverse its decision to honor Mr. Desalegn in light of gross human rights violations in Ethiopia being perpetrated by the regime he serves. The administration of the American evangelical university made the decision in an emergency meeting last Friday after this reporter raised a number of critical questions on whether honoring a human rights violator was consistent with APU’s core values and motto. The Global Alliance for the Rights of Ethiopians (GARE) also wrote a letter highlighting gross human rights violations being perpetrated by Mr. Desalegn and the TPLF-led regime he is serving. 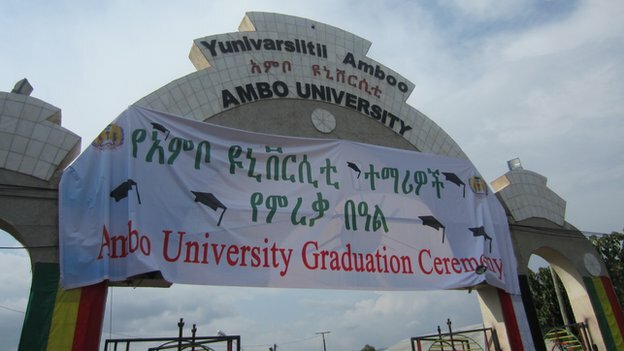 The honoring ceremony, which was slated for July 31 at the university’s Los Angeles campus, was expected to be attended by the PM and his family, foreign diplomats, the university faculty, senior U.S. and Ethiopian government officials including Foreign Minister Tedros Adhanom and other ministers. Rachel White, APU’s Assistant Director of External Relations, confirmed exclusively to this reporter that the university has withdrawn the honor and cancelled the ceremony which was planned to honor him at APU’s Los Angeles campus. “I can confirm that the event has been cancelled. The university evaluated current developments in Ethiopia including the latest U.S State Department Human Rights Report,” she said. She also indicated that the recent high court decision to file terrorism charges against Zone9 bloggers and journalists was also one of the factors considered for the cancellation of the event to honor Mr. Desalegn. “Nothing is as important as our motto God First. Any decisions we make have to be consistent with our motto and core values,” White noted. She also pointed out that respect for human rights is very important for the university. It is now confirmed that he cancelled his trip to Los Angeles after the university communicated to him its decision to cancel the honoring ceremony. 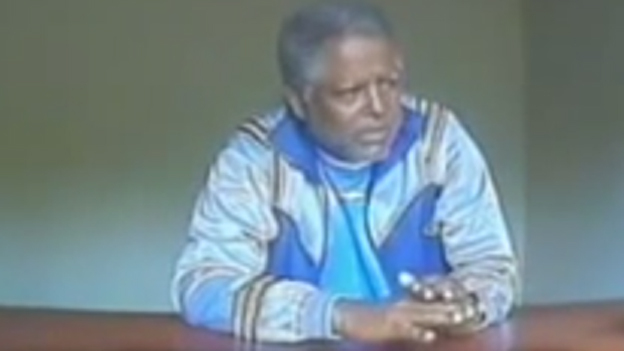 According to a university source, who spoke on condition of anonymity as he was not authorized to give a statement on behalf of the university, APU’s administration unanimously agreed to withdraw the honor for Mr.Desalegn, whom it found to be an unsuitable honoree after evaluating not only the disturbing human rights situation in Ethiopia but also the potential negative publicity that the event was likely to generate. “It was a wise and timely decision, as the university was likely to face backlash if it publicly honored a human rights violator,” the source said. Exiled journalist Serkalem Fasil, who was forced to give birth in jail, commended the university for correcting its mistake in good time. “I think this university did not know who Hailemariam Desalegn was. They should have known that Ethiopian government officials like him do not deserve honor but facing justice for the crimes they are committing against humanity. Serkalem said Azusa Pacific corrected its mistake in an exemplary manner. “I am glad the university listened to the truth and its God First motto,” she said. Her husband, the award-winning journalist Eskinder Nega, is serving an 18-year sentence in Ethiopia after he and a number of journalists and activists were labelled “terrorists” by a Kangaroo court. 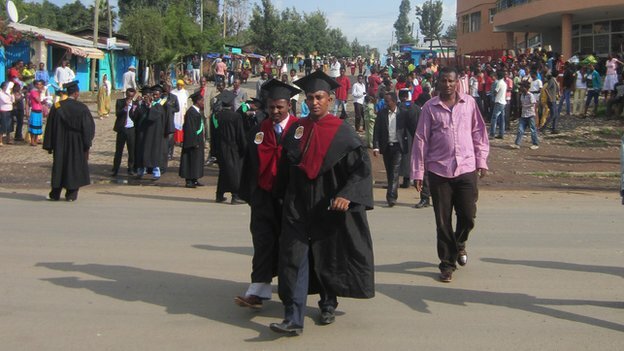 Abebe Belew, a Washington D.C.-based activist and community radio broadcaster, who was also convicted of “terrorism” offenses because of his critical views towards the repressive policies of the Ethiopian government, also praised the university for its decisive measure. “This university is a truly Christian university. It made a bad decision but realized soon enough that honoring an ungodly human rights violator contradicted its Christian values. I appreciate the university’s administration for taking such a strong stand based on its God First motto,” he said. “Hailemariam should also learn from the humiliating experience. He pretends to be a protestant Christian but what he is doing completely contradicts all the tenets of the bible. Complaining of bullying in the international justice arena, African leaders are forging ahead with plans to set up their own regional court — and give themselves immunity in the process. The African Union (AU) accuses the Hague-based International Criminal Court (ICC) of anti-African bias and racism, and plans for a home-grown mechanism are inflaming a stand-off over who deals out justice in Africa. In a decision last month, AU leaders unanimously agreed to grant sitting heads of state and senior government officials immunity from prosecution at the African Court for Human and Peoples’ Rights, which is not expected to get off the ground for several years. The Hague-based ICC rules that no one is protected from prosecution, but many African leaders are quick to point out that all of the ICC’s eight cases are against Africans. Their initial enthusiasm for the international tribunal — four of the ICC’s cases were referred to it by African governments — is now wearing thin. The ICC is pursuing, among others, Sudan’s Omar al-Bashir, indicted for crimes against humanity in war-torn Darfur, and Kenyan President Uhuru Kenyatta and his deputy, William Ruto, who are on trial for allegedly orchestrating post-election violence in 2007-08 that left at least 1,000 people dead. Ethiopian leader Hailemariam Desalegn: "If you have any connection with terrorists don't think that the Ethiopian government will let you [go] free"
Ethiopia had a moral obligation to arrest the opposition leader who was controversially extradited from Yemen last month, Ethiopian leader Hailemariam Desalegn has told the BBC. "Andargachew Tsege is a Trojan horse for the Eritrean government to destabilise this country," he said. He was sentenced to death in 2009 while in exile for plotting a coup. Foreign governments could express their concern, but the man would be dealt with according to the law, the PM said. Andargachew, a UK national, is secretary-general of Ethiopia's banned Ginbot 7 movement. The group says Andargachew was on his way from the United Arab Emirates to Eritrea when he was detained at Sanaa airport on 24 June. 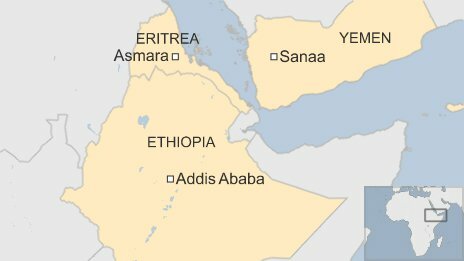 Ethiopia and Eritrea are long-time rivals and the neighbours fought a bitter border war between 1998 -2000, which left some 100,000 people dead. Earlier this week, the British Foreign Office said it had raised its "deep concerns" with both Ethiopia and Yemen over Andargachew's extradition and had requested reassurances that the death penalty, imposed in absentia, would not be carried out. Prime Minister Hailemariam rejected concerns about Andargachew's treatment. He said his trial and that of several other Ginbot 7 leaders in 2009 - who were charged with planning to assassinate government officials - was "fair". "His stooges were there, who were sent to destabilise and bomb this country - they were captured red-handed with their bombs and their detonating elements," he told the BBC's Focus on Africa programme. Asked if the death penalty would be carried out now that Andargachew was in custody, the prime minister replied: "I cannot say this now." Mr Hailemariam said Ethiopia was a young democracy and opposition parties were allowed to operate, but terrorism would not be tolerated. "If you ask me to tolerate in the name of democracy those who are engaging [in] destabilising the country and acting as a terrorist and using guns to change government, then you are wrong," he said. The prime minister also denied that Ethiopia was heavy handed in applying anti-terror laws. The country has faced criticism from donors for jailing its critics - and most recently some of the country's leading bloggers. Mr Hailemariam, who became prime minister in September 2012 following the death of long-time leader Meles Zenawi, said no matter people's professions, those found to be linked to "terrorist groups" would be dealt with. Ginbot 7 (15 May) was named after the date of the 2005 elections, which were marred by protests over alleged fraud that led to the deaths of about 200 people. Britain’s intelligence and security agencies are facing claims that they were complicit in the brutal torture of a British man secretly detained in an African prison. Ali Adorus, a security guard from east London, was subjected to electrocution, hooding and beatings during his 18 month imprisonment in Ethiopia, according to allegations made against Ethiopia and Britain to the United Nations High Commission. Before leaving Britain to visit family in Ethiopia in 2012, Mr Adorus had complained that he had been targeted by the Metropolitan Police and the Security Service, MI5, over alleged links to Islamic extremism. Now his lawyers say that some information contained in a false confession, which he claims was beaten out of him in an Ethiopian prison, could only have been provided by “British intelligence”. It is the latest case in which Britain has been accused of complicity in the torture of UK nationals and residents. Mr Adorus, who has a wife and child in the UK, has been put on trial for terrorism offences in Ethiopia and if found guilty could be sentenced to death. Last night his wife said: “On the surface the Foreign Office appears to be helpful; they are consistently blaming the Ethiopians for the fact nothing is moving forward. “But without me pushing them or lawyers here pushing them, they would not visit my husband, or follow up with his medical issues or follow up on his complaint of torture. Mr Adorus, who was born in Ethiopia before coming to the UK as a young boy, was arrested on 25 January 2013 on a bus during a family visit, and taken to a police station without any access to a lawyer. During his custody, he signed a forced confession in Amharic – a language he does not speak – after four days of beatings, he alleges. He is accused by the Ethiopians of being a member of a number of terrorist groups and of waging a jihadist war since 2006. But his lawyers say the case against him is fabricated and have made a petition to the United Nations, which is now considering the complaint. Mr Adorus, whose case has been investigated by the human rights group Cage, has a history of testicular cancer and was being monitored regularly in London. Mr Adorus and two friends had previously complained that they had been questioned by police and MI5 after returning from a safari holiday in Tanzania in 2009.